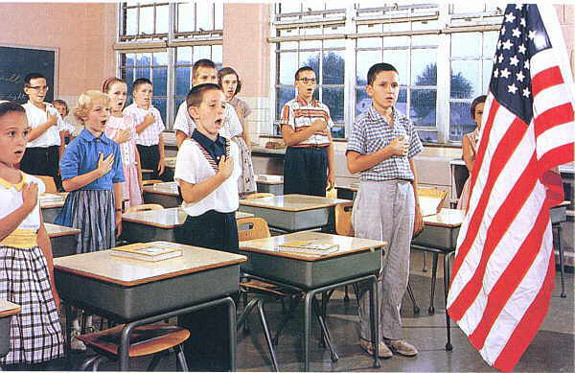 When I was a student at Memorial Junior High School, we stood each morning, put our hands over our hearts and recited The Pledge of Allegiance. On one particular morning, while the Vietnam war was in its final years, I did not feel like standing. I was 13 years old. I was not taking a political stand. I didn't even know what taking a political stand meant. I just did not feel like getting up from my seat that morning. One of the Home Ec teachers, a rough woman whose name is lost to time, pulled me up by the scruff of my neck and castigated me publicly. How dare I not stand for The Pledge of Allegiance when she had a son fighting for America's freedom in Vietnam? Now it's September 11, 2001 and all of a sudden, it dawns on me that America is the latest in a long series of host countries for the Jewish people. In trying to reconstruct how the events of that day led me to such a conclusion, I can draw only the fuzziest of lines. The line starts with the thought that, if such a thing can happen in America, then America is not intrinsically safer than Israel. If America is not intrinsically safer than Israel, then why am I not living in Israel? In retrospect, it wasn't logic that opened the door to understanding. It was a gift from Hashem, Who cleared my vision. In June of 2002, while the Second Intifada raged in Israel, my husband and I traveled to Israel. Our decision to do so was a puzzlement to many American Jews, so I spoke about it publicly. What I most remember was that, right after my talk, a man in his 70s came up to me to castigate me. He was less hostile than the Home Ec teacher from 30 years before, but his message was similar. How dare I speak against America? Don't I know how dangerous it is for American Jews to speak like that? I said that in 2002 and, seven years later, I still mean every word of it. And it still causes a tremendous ripple of hostility. Recently, my husband and I were interviewed by the Baltimore Jewish Times about our decision to make aliyah. In that interview, I talked about some of the political and theological reasons for our decision. In addition, Dr. Adler said she believes such recent developments as the economic downturn and President Obama’s election demonstrate that “God is closing the doors for Jewish life in America, to bring on the redemption and bring us home. In the few weeks since the article appeared, my comments have been the source of seemingly endless castigation. I have been accused, in Letters to the Editor, in private conversations, in online comments, in sermons by rabbis of liberal congregations and in private emails of the very same thing that my 8th grade Home Ec teacher accused me of. How dare I criticize this great country of ours after all it has done for me? How dare I suggest that the door is closing on America's Jews? How dare I declare America a diaspora community? Didn't I notice that the President appointed Jews to two very senior positions? And, most potent of all, don't I know what bad will my comments will generate among non-Jews? Bad, bad Rivkah! You are a disloyal American! I have clearly made a lot of people uncomfortable. And I have never felt as misplaced and displaced in America as I do today. My critics keep reminding me that 80% of American Jews voted for Obama. That's the same percentage of newly-freed Hebrew slaves who chose not leave Egypt. Is it also the percentage of American Jews who will cling to America even as the threats against us mount? The Golden Age of Spain, when Jews thrived religiously, culturally and economically on the Iberian Peninsula, lasted for 400 years. Power changed hands, history moved on and Jews were painfully expelled from Spain in 1492 and from Portugal in 1497. Jews lived in Germany as early as the 4th century. For 200 years, from the early 18th century until the early 20th century, Jews achieved political emancipation and prospered in Germany. Power changed hands, history moved on and 6,000,000 Jews were killed by Nazis. This exact same scenario has played out in dozens and dozens of other countries since the destruction of the Second Temple. I will say it again. One hundred years ago, America took in my great-grandparents when pogroms in Russia threatened their lives. My children are 4th generation American-born. There is no doubt that, since 1654, America has been a haven for the Jewish people. There is much to appreciate about America's role in Jewish history. But power changes hands. History moves on. If my awareness of Jewish history and my desire to keep my family safe in the face of the growing Muslim influence in America makes me evil in the eyes of other American Jews, so be it. At least I know my place. For months now, I've been having an ongoing conversation about the viability of aliyah with a family member who I love very much. Drawn to the spiritual potential that he knows exists in a life lived in Israel, he has all the same concerns that you might expect. How will he make a living? How will the transition impact his family, especially his young teen? If living in Israel is so important, why are some of his rabbis actively discouraging him from making aliyah? I've been sharing concrete information, brainstorming communities where his family would fit in, encouraging him to attend aliyah meetings, referring him to job leads and resource people who can help answer his most pressing questions. But what I can't seem to communicate as clearly as I wish to is this thought. Once upon a time, a Jew could decide where she or he wanted to live. Israel was a fine choice, but so was Monsey. Or Lakewood. Or Toronto. Or Baltimore. Today, I feel so strongly that we no longer have that luxury. Things in the world are changing dramatically and time is running out for American Jews. The balance of power in the world is demonstrably changing from the good guys to the bad guys. For myself, my response is to get my Jewish family out of America to Israel where I believe Gd will protect us from what's coming this way. Though I wish that every Jew I love would come with us, I understand this may not be their response. But what I really want to say is, "Folks! Wake up! You're clinging to a withering vine!" Geert Wilders, a controversial Member of Parliament of The Netherlands, recently gave a speech to the Florida Security Council about the Islamic threat to which Europe is already succumbing and to which America is exceedingly vulnerable. I am not, by nature, a political animal, but I do believe his speech is of urgent importance for Americans, and especially American Jews, to watch. Please take the time to watch these two 10-minute clips so that at least you understand better the enemy that Europe and America is facing because, in time, Gd-forbid, this knowledge could radically change your life. And if you get it, if you feel in your kishkes that the clock is running out on the lives we have enjoyed in America, I'm sure there's still room on our aliyah flight. I knew my first labor experience would be painful, but I didn't know it would be so painful that I would feel as if I had transcended my own body and entered a different dimension. When my oldest daughter was finally born, I remember thinking, "Why didn't anyone tell me it would feel like this?" As the founding coordinator of the Baltimore Chug Aliyah, I have watched many people make aliyah over the past four years. I thought I knew, more or less, what to expect from start to finish. Now that the news of our impending aliyah is out, I find myself experiencing emotions that I didn't know to anticipate. It started when we began talking about paring down our not-insubstantial collection of books. With a rabbi, an educator and a few voracious readers in the house, we have a LOT of books. So we told each other we would start by separating out those books that "didn't hurt." If you love books, you know exactly what I mean. We started the process, but as each book is transferred from our hands to the hands of another reader, I get a funny feeling, like I'm not quite ready to let it go, even if I haven't cracked the book open in a decade or more. Then we had to take a hard look at our furniture, some of which was part of my childhood home and some of which I bought when I was a teenager with a JCPenney employee discount. As I examined each piece in the decision-making process, it seemingly took on a mystique of its own, one I hadn't been aware of all those years it sat in the basement, unused. Thirty five years ago, my father, A"H, bought me a beautiful, feminine writing desk. I loved the desk, but as I got older, it played a smaller and smaller role in my home. Alas, it was one of the pieces I was called upon to sacrifice in the quest to fit five decades worth of life into a small Israeli apartment. A few prospective buyers came to see it. One immediately rejected it because of a shallow scratch on the writing surface. One offered me a pitifully low bid which I quickly declined. Money being money, I did so more from sentiment than anything else. Then a mother and her 7 year-old daughter came to see it, gushed over its beauty and specialness and I knew they were the right buyers. So even though, knowing the desk will no longer be mine, I have a twinge of something I cannot name, I am happy that another young girl will appreciate it, as I have over the years. Last week, I went to close a bank account that I opened 25 years ago, just as my career began. The account had been more-or-less dormant for well over a decade, but there was a little cash there to add to our Aliyah Savings Fund. Was I really feeling sentimental about a checking account? Ahead of me in these next months lie dozens, if not hundreds, of these sorts of experiences. I am extricating myself from five decades of life in America. Unraveling decades-long business connections. Sorting out the detritus of a lifetime. Freeing myself from the tentacles of materialism and preparing myself to be open to my future. Even though I have been dreaming of boarding that aliyah flight and living my life in Gd's Holy Land for years and years and years, ahead of me are any number of twinges and gut punches as I disentangle myself from a lifetime lived elsewhere. I didn't know to expect that. And yet, I know that even this is a bracha. How many millions of Jews over the span of Jewish history have had the luxury of such a gradual parting from their sojourn outside the Land of Israel? Hashem has truly blessed me.